Sunday’s post from the sidelines of a close Army-Navy game may have had history on its side, but it lacked a bit in drama. And color. And focus. And … well, it was 1911 — sports photography has improved a bit over the past 100 years. 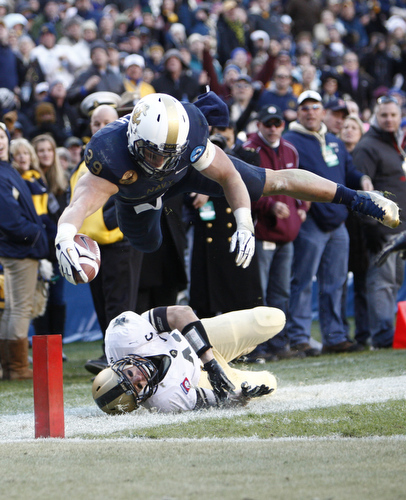 Navy’s Alexander Teich leaps for a second-quarter touchdown during the Mids’ 27-21 win over Army on Dec. 10 at FedEx Field outside Washington, D.C.
Navy’s Bruce Andrews (80) and David Wright (18) celebrate after their team’s victory. 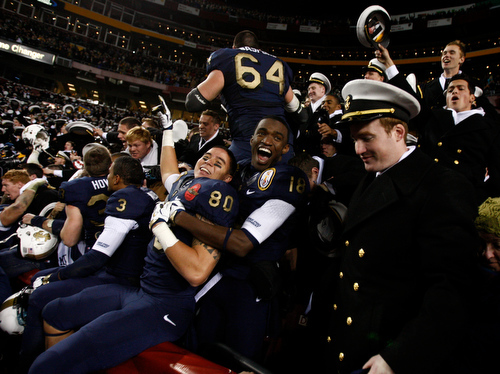 The 27-21 Navy win marked the 10th straight for Annapolis. Senior fullback Alexander Teich (the jumper in the top pic) had 93 yards on 18 carries in his last collegiate game. The contest was tied at 21 after three quarters; two late-game field goals by Navy’s Jon Teague made the difference.